According to Nokia, anyone using a smartphone over the last five years (coinciding with the launch of the OG Apple iPhone, of course) has been merely beta testing handsets so that Nokia could create a model with none of the flaws found in the other phones. 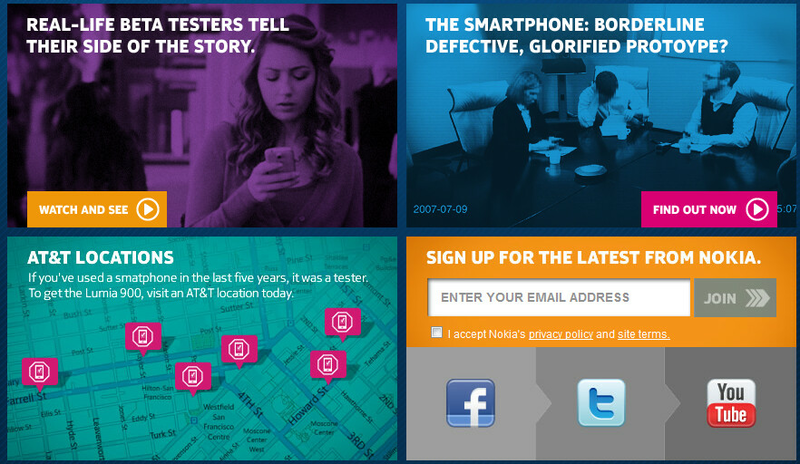 To support this make believe world, the smartphonebetatest.com web site is now live and includes a couple of commercials promoting the Nokia Lumia 900 as the first smartphone that is not a beta test. It's an interesting promotional idea, but how many Apple iPhone 4S and Samsung Galaxy S II owners are going to believe that they are holding a beta model in their hands? The site also includes those shots taken at the Apple iPhone that we discussed a few days ago, including the one that makes fun of the infamous left-handed death grip. Also on the site is a map that shows you where your closest AT&T locations are so that you can get rid of your beta phone and buy the Nokia Lumia 900 for $99.99 with a signed 2-year pact. I actually kinda agree. Nokia has fixed a lot of issues with their phone. Like the screen glare issue, firmware issues, developer issues... maybe they listened to the customers. Indeed. Nokia has listened and if continue so, they will do well in smartphone markets. ummmm....the point is to sell THis PHone, as long as it works, why noT! If you think about it, yes, they were. The N9 introduced the design for the 900 , but had doomed software. The 800 was a next step, but had battery problems and a Pentile screen. Now Nokia finally learned from its past and others' past devices. The return of the king !!!! Nokia is back !!!! That's no way to talk about your mother! Maybe the best add campaign ever !!! Excelent marketing !!! Bravo Nokia !!! I think this marketing campaign will work. I think it's actually pretty clever. Come out the corner swinging. Let's see if this works. Speaking of this has anyone seen these ads on TV? lol, beta phone, yet the latest from Android has a quad core, and aluminium unibody while the lumia is a single core plastic unibody. Nokia and Microsoft are getting way too cocky way too fast. Their phones hardly even made a dent in the smartphone market and they're already making ads like this. At least when Samsung and Apple does it, it makes sense since they make up majority of the smartphone market. Quad core is experimental at the moment, as well as whatever version of Android that's out there. They've already announced the next 2 fragments..
Love the 'Death Grip'(too funny with the thrown ball of paper) and the 'It's Over' spots. Some guns blazing cool spots against the competition. GO NOKIA!!! Doesnt really say a lot when you simply bag the competition as a way to get ahead. Its a fine line youre walking saying everyone else (including your previous devices) are crap but now we're great......really. That said, clever marketing and well done for an ad. Almost at the mac vs pc level of marketing. Who is that girl! Which such lovely eyes, smile! What's her name! Where is she! Why my heart's going bom bom bom! Would love to see that girl! Wow i like that girl! what I hope most is Nokia keeps improving their Windows smart phones The Nokia Lumia 800 had battery and camera problems and they made good and got rid of these problems. The Nokia 900 will probably have some bugs that Nokia will have to fix. I really believe Nokia will sure Americans get a good Nokia smart phone because failure is not an option at this stage of the game.